works with Credit Cards Processing Company Harbortouch Office, to offer you a $5,000 to $3,000,000 loan is less than a week! We'll Consolidate Your Existing Daily, Weekly or Monthly Business Loan or Merchant Cash Advance Payments Into One Low Monthly Payment. Same Day Funding, Regardless Of The Number Of Existing Business Loans Or Merchant Cash Advances You Currently Have. We'll Consolidate Your Daily, Weekly or Monthly Payments Into One Low Monthly Payment. 0% Interest Rates Are For Selected States Listed Below. If Approved, We'll Pay Off Your Existing Loans or Merchant Cash Advances. You're Get A New Loan In 30 Minutes. Funds Will Be Submitted To Your Bank Account The Same Day You're Approved. Get A $5,000 to $75,000 Loan In Less Than A Week In The Following States: We'll Consolidate ALL Your Existing Small Business Loans or Merchant Cash Advances With The Following Special Offers: A No Interest Rate, Monthly Payback Of $4,000 - $60,000 In 6 to 12 Months, Unsecured Non-Bank Business Loan In AL, AZ, DC, DE, HI, ID, IA, IL, IN, KS, KY, LA, MD, ME, MS, MO, NE, NH, NM, NC, OH, SC, UT, VA, WA, WI, WY. We Offer A 5% - 149% Annual Interest Rate, Monthly Payback $3,500 - $75,000 In 2 to 10 Years (Pay It Back Quickly To Lower Your Interest Rate -- No Prepay Penalty! ), Unsecured Non-Bank Business Loan In AL, AZ, DC, DE, HI, ID, IA, IL, IN, KS, KY, LA, MD, ME, MS, MO, NE, NH, NJ, NM, NC, OH, OR, SC, UT, VA, WA, WI, WY. Need A FICO Score of 500 or Above, Minimum of 2 Months In Business, No Open or Dismissed Bankruptcy (Discharged Only), No Restrictions on Business Type, Sole-Proprietor OK; For-Profit Businesses Only. Submit Drivers License or State Issued ID; Voided Check and 2-3 Months Business Bank Statements. You'll Receive A Secure Email Link To A 1-Page Application. Get Money For Working Capital, Equipment Financing Loans, Hard Money Loans and Bridge Loans. Q: How does this apply to my Approval? A: Regardless of the product your're pre-qualifed for, consolidation is available. Q: How does this consolidation work? A: Upon your approval; you will need to provide your payoff letter(s) from existing business loan or merchant cash advancing companies for your existing, outstanding, debt(s). We'll distribute your approved, net funded amount to this outstanding debt(s), and you will receive the difference (net proceeds). Q: Do the net proceeds need to be 50% of the business loan amount? A: No, There is no set amount you need to net. Even if there are not any net proceeds leftover to deposit into the business bank account, We can still help you consolidate. Q: Will this delay normal "Same Day" Funding time? A: No, we will fund both you and your outstanding lenders at the same time. Q: How many positions (outsanding or existing business loans) can you consolidate? A: There is no set number of business loans or merchant cash advances that we can consolidate. As long as our net funded amount on your approval is less than your total outstanding $dollar amount, We can pay them off. Get A $5,000 to $3,000,000 Loan In Less Than A Week Nationwide! We'll Consolidate ALL Your Existing Small Business Loans or Merchant Cash Advances With The Following Special Offers: A No Interest Rate, Monthly Payback Of $4,000 - $60,000 In 6 to 12 Months, Unsecured Non-Bank Business Loan In AL, AZ, CA, DC, DE, HI, ID, IA, IL, IN, KS, KY, LA, MD, ME, MS, MO, NE, NH, NM, NC, OH, SC, UT, VA, WA, WI, WY. We're Offering A 5% - 149% Annual Interest Rate, Monthly Payback $3,500 - $75,000 In 2 to 10 Years (Pay It Back Quickly To Lower Your Interest Rate -- No Prepay Penalty! ), Unsecured Non-Bank Business Loan In AL, AZ, CA, DC, DE, HI, ID, IA, IL, IN, KS, KY, LA, MD, ME, MS, MO, NE, NH, NJ, NM, NC, OH, OR, SC, UT, VA, WA, WI, WY. Need A FICO Score of 500 or Above, Minimum of 2 Months In Business, No Open or Dismissed Bankruptcy (Discharged Only), No Restrictions on Business Type, Sole-Proprietor OK; For-Profit Businesses Only. Submit Drivers License or State Issued ID; Voided Check and 2-3 Months Business Bank Statements. You'll Receive A Secure Email Link To A 1-Page Application. Get Money For Working Capital, Equipment Financing Loans, Hard Money Loans and Bridge Loans. All you need is a minimum FICO score of 500 - 540 or above; mimimum of $5,000 in monthly sales (multiple monthly bank deposits totaling $5,000); been in business for 1 year and 3 month's of business bank statements to qualify. 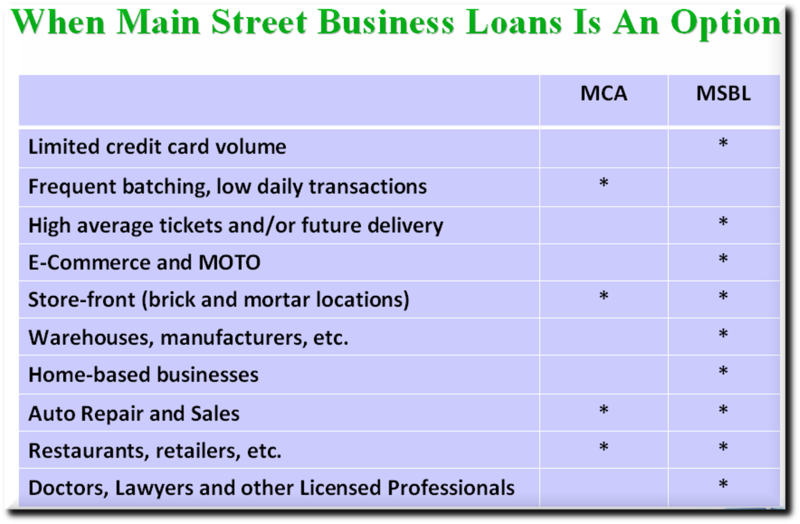 is a leading provider of Merchant Cash Advances (MCA), sometimes called a business cash advance and now our newest product, Main Street Business Loan (MSBL), (unlike a traditional bank loan) is an alternative business loan which is a short-term loan program based on the merchant or business owner's total gross monthly sales volume. We are excited to introduce this new loan product aimed at “Main Street Businesses” that are unable to receive a traditional bank loan. This product is geared towards businesses that typically would not fit the business type criteria for a merchant cash advance. Perfect time to APPLY NOW! 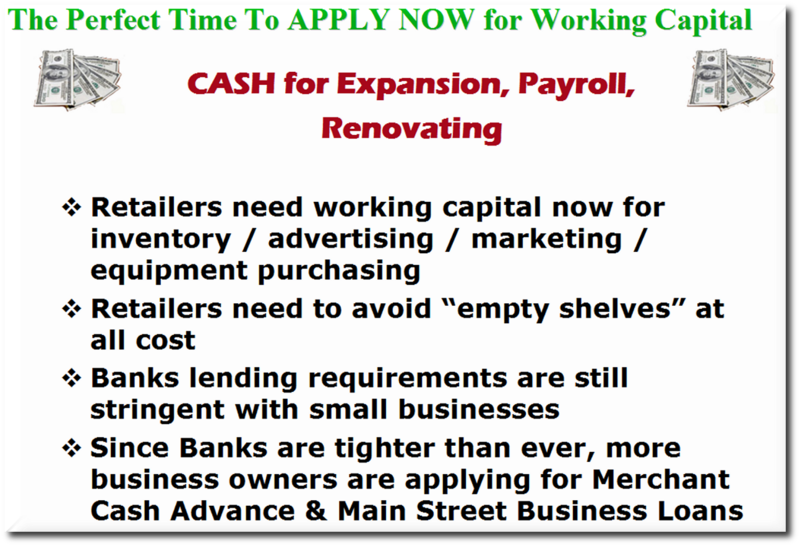 Downlaod Main Street Business Loan Application or Download Merchant Cash Advance Application and email it along with required documents to info@mainstreetbusinessloan.com or fax it to 800-317-6414.